Jordan Lee, member of the Mossy Oak Fishing Team won the inaugural Major League Fishing (MLF) Bass Pro Tour title. 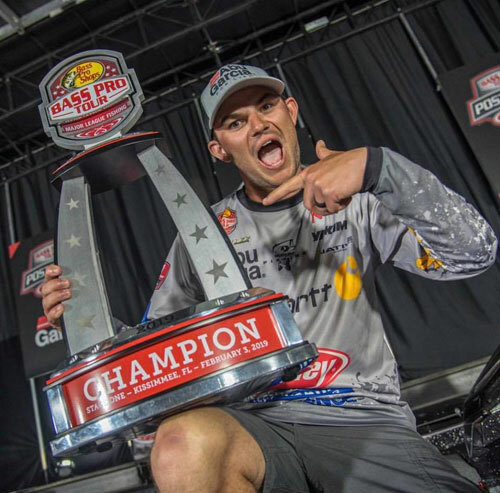 Lee, from Cullman, Alabama, who won back to back Bassmaster Classic Championships in 2017 and 2018 and the collegiate championship in 2013, now claims the first MLF Bass Pro Tour title that took place this past weekend (February 1-3) in Kissimmee, Florida. In the final two hours, Lee added over 32 pounds to his score to finish with a total of 55 pounds, 1 ounce. Lee was one of eight Mossy Oak Fishing Team members to compete in the tournament. Watch Jordan's story on Mossy Oak Capture series "Elements." Stage Two of the MLF Bass Pro Tour kicks off February 12-17 in Conroe, Texas. To see the full results from Kissimmee, visit https://majorleaguefishing.com/event/bass-pro-tour-stage-one-kissimmee-fla/results/. Mossy Oak partnered with Major League Fishing in 2017 to become the official pattern of its professional angling competition where the Elements Agua pattern is showcased. Mossy Oak has added professional bass fisherman Ott DeFoe to the Mossy Oak Fishing Team. Established this year in conjunction with the launch of Mossy Oak Elements, the Mossy Oak Fishing Team is growing with bassmasters KevinVanDam and Gerald Swindle and saltwater fisherman Mark Davis already on board.